A healthy smile is key to your quality of life. If you are missing all	of your teeth, finding a solution that allows you to perform simple daily	tasks like eating and speaking naturally can be difficult. At Emerald	City Smiles in Mountlake Terrace, WA, we offer teeth in a day: all-on-four	/ all-on-six implant-supported teeth are a long-term option for replacing	your teeth and some of the roots. All-on-four / all-on-six implant-supported teeth will give you your smile back along with the confidence that their stability ensures. Implant-supported teeth are the perfect solution for replacing missing	teeth. They consist of prosthetic teeth attached to four, five or six	titanium dental implants that are are secured directly to the jawbone. They are a good solution for those who have lost all of their teeth but	still have enough remaining jawbone to support the titanium implants. They’re particularly helpful on the lower jaw, where traditional	dentures are far less stable and can become uncomfortable and even painful	over time. Dental implants are small, screw-shaped titanium posts that that are placed	in the jawbone where they act like the missing tooth roots. There they	fuse to the bone and become strong and stable. 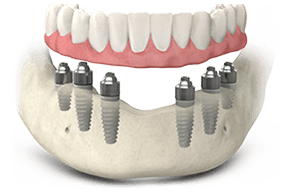 Fixed bridges are then	attached to the portion of the implant that protrudes from the jawline,	giving patients back their smile. This can happen all in one day. To learn more about dental implant procedures, click on the link below	from your Mac or iOS device to download the MIS Dental Implant Patient	Education iBook. The all-on-four implant procedure can take place in just one day at our	Mountlake Terrace office for those in the Edmonds – Shoreline area. Initial consultation: Dr. Nejad has advanced training in the placement of implants, and he will	review your medical and dental history and conduct the CT scans, x-rays,	and imaging necessary to determine the course of the surgery and how the	replacement teeth should be constructed. Surgery: Tooth extractions, bone shaping, and implant placement happen all during	one surgery while the patient is comfortably sleeping and enjoying the	benefits of sedation dentistry. This is carried out using the revolutionary	V2R guided surgery protocol. Temporary dentures: Temporary acrylic teeth are made and attached to the new implants. They	are worn approximately 6 months, until healing is complete. Permanent teeth: Once healing is complete Dr. Nejad removes the temporary teeth and replaces	them with the permanent ones, which function just like natural teeth. Talk to Dr. Nejad to find out if the Prettau Bridge is right for you. The titanium implants are permanently placed in your jawbone. The prosthetic	teeth can be replaced if ever necessary. How much do implant-supported teeth cost? Dr. Nejad is proud to offer all-inclusive pricing. Most patients qualify	for this one-fee approach. And, thanks to the V2R guided surgical protocol,	we can offer implant-supported teeth more economically than the large	corporate implant clinics. If you would like an accurate estimate of the	cost for your unique situation, set up a consultation with Dr. Nejad to	find out more. Yes, implant dentures are very safe and offer increased stability and	comfort to patients. It’s important that the implants stay immobile until they fuse to	your jaw. For the first 6 to 8 weeks after surgery you should stick to	a soft diet and avoid hard or crunchy foods. Once healing is complete,	you will receive your permanent implant-supported teeth and will be able	to eat foods that you couldn’t before, and you’ll feel confident	while speaking and socializing. For even more information on how dental implants can improve your life,	please visit the	American Academy of Implant Dentistry. If you want to get full functional teeth in just one day,	give Dr. Nejad and his team in Mountlake Terrace a call today! We work with everyone in the Seattle area, from Edmonds to Shoreline.